BLOOMINGTON, Ind. 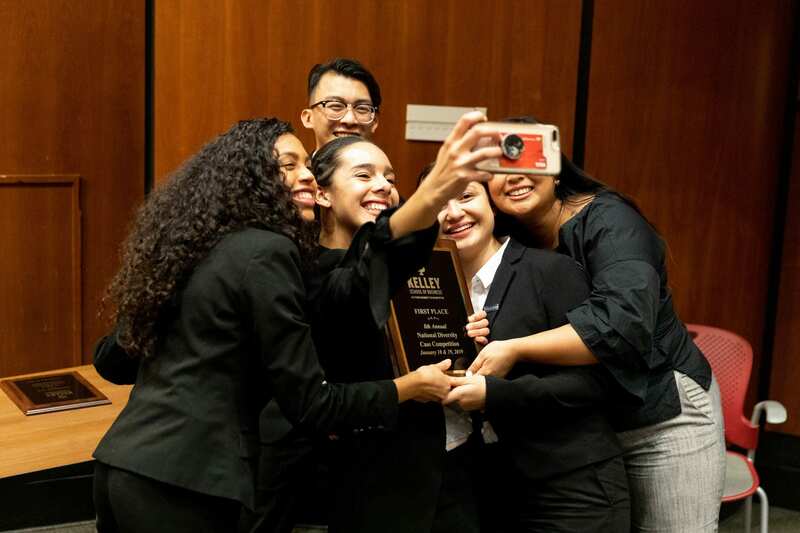 – Capping off the largest National Diversity Case Competition ever was another historic first, a first-ever tie for first place. A team of students from the host school, the Indiana University Kelley School of Business, shared the 2019 top honors with a team from the Haas School of Business at the University of California-Berkeley (pictured above). “This tells you how rigorous the competition was,” said Diana Rath, a senior at Kelley majoring in marketing, professional sales, and technology management from Lawrence, Indiana. “We knew from the beginning that it was going to be tough, but that motivated us to work even harder. “The judges even spent an extra 30 minutes deliberating, which shows how great all of the presentations were,” added Rath, who served as the team’s captain. 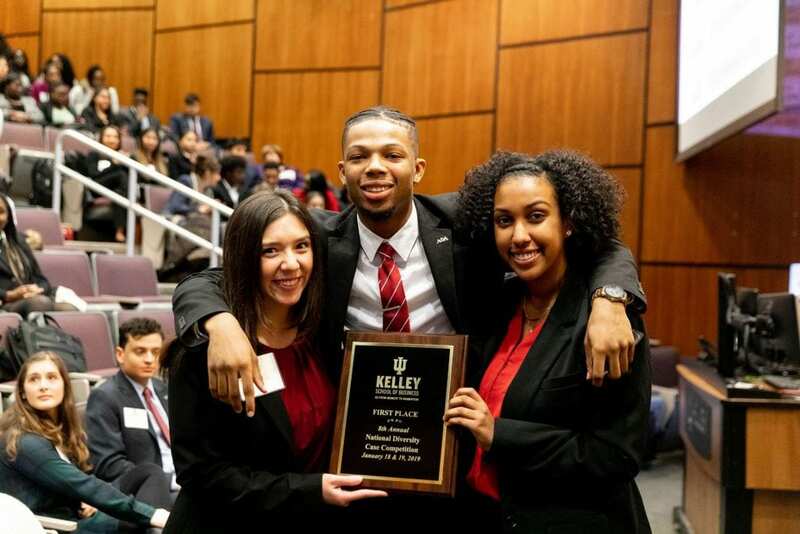 Also representing Kelley were Liwam Gebreslassie, a sophomore majoring in accounting and finance from Indianapolis; and Sharod Holmes, a junior majoring entrepreneurship from Merrillville, Indiana. The National Diversity Case Competition is held annually the weekend before Martin Luther King Jr. Day and brings together some of the best and most diverse talent in undergraduate education from across the country. This was the eighth year for the event, which took place Jan. 18-19. The two teams – which each received a $6,250 cash prize — emerged victorious from among a record field of 42 teams. All focused on a case provided by Target Corp. that examined the role that small-concept stores can play in urban areas. In addition to becoming a national champion, Rath said she learned a lot about herself through the competition. “I learned that I am capable of doing anything that I set my mind to. If you would have told me as an incoming freshman that I would be representing Kelley in a national competition, I would have laughed in disbelief. I used to be terrified of public speaking, but I’ve come so far in the past four years,” she said. “I’ve had to work on at least one case in every Kelley class I’ve ever had, so it seemed like I was just doing a regular project,” she added. Despite weather issues – including a snowstorm — all the teams coming to Bloomington from coast to coast arrived safely and also benefitted from workshops and a networking event with 18 corporate partners. The winning Kelley team is pictured below. Left to right, they are Diana Rath, Sharod Holmes, and Liwam Gebreslassie.